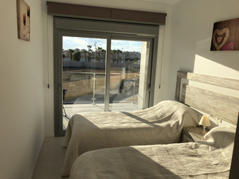 This is a brand new apartment situated Northwest of Torrevieja Town using the latest design and technology on a secure gated community. 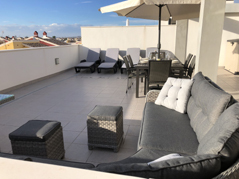 The architecture is developed over 2 floors and the property benefits from private parking with automatic doors,a large terrace and an amazing 60m2 roof top solarium with BBQ, kitchen area, dining table, chairs & parasol, sofa & sun beds. 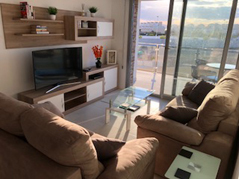 The interior layout has an entrance hall with a built-in cupboard, a large living dining-room with high ceiling and French patio doors with a Smart TV and blueray/dvd player with access to the front terrace. The TV has English channels, ITV, BBC1 etc. There are 160channels in all with some Swedish, Spanish, Norwegian and Danish channels, plus catch up is available. We offer fibre optic wi fi free of charge of 20MGB. There is a sofa bed in the lounge. The ultra modern open kitchen with island has an integral fridge freezer & dishwasher, built in microwave, oven/grill, electric hob, kettle, and toaster. The master bedroom has a glazed dressing-room and en-suite bathroom with double washbasin, shower cubicle and his and hers washbasins. There is a PVC window with electric shutter & blinds. The second bedroom has a built-in wardrobe and the bathroom has a glazed-shower with a suspended washbasin. These state-of-the-art properties include entrance security door, conducted A/C pre-installation, Aerotermia equipment to heat the water with a tank of 110 litres, and PVC windows with electric shutters. There is air conditioning throughout the property. The shared communal pool is a short walk away. The Costa Blanca is an ideal location for a summer or winter sun holiday with an average of 320 days sunshine each year. Torrevieja is a fast developing Mediterranean coastal town situated approximately 30 miles from Alicante / Murcia airports on the Costa Blanca, in the south east of Spain. It is easily accessible due to the main N322 road and the A7 motorway .It is situated next to the sea in the south of the Valencian Community and it boasts lots of beaches, a natural park and salt lakes where there is an abundance of flamingos and other wildlife. Due to the vicinity of the salt lakes, Torrevieja benefits from a microclimate that has been a long favourite with the Spanish and Nordic tourists who come year after year for its beneficial effects. Torrevieja has even been voted as one of the best places to live by the World Health Authority. Torrevieja: A popular place to stay, Torrevieja caters well for tourism, with plenty of activities on offer by day or night although it isn't a resort in the package holiday sense.The town provides first class facilities for lovers of all sports - there are golf clubs, a flying club, a variety of water sports and the municipal stadium with an athletics track, sauna and covered courts for tennis. Visitor numbers increase greatly during the summer months of July and August, and Easter is another popular time, it's no wonder with a fantastic climate, lots of restaurants and shops galore, Torrevieja is the ideal choice for a fun-packed holiday in the sun. 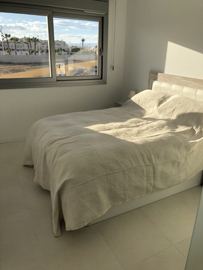 It is also ideally placed for a short golf break, there are many professional golf courses within 20 minutes drive from the accommodation, notably Villamartin, Las ramblas and Campoamor. Zenia Boulevard, the largest shopping centre in Europe which opened on 25 September 2012, is a five minute drive away. Zenia Boulevard has a traditional Mediterranean design, featuring more than 600 trees and 55 different plant species in the various gardens and open spaces which give colour to the shopping centre. Its layout is designed to reflect a typical Spanish village, with various "town squares" such as Plaza London Square or Plaza Mayor linked by "streets" lined with shops of every description. If day trips are your thing then there is plenty to do and see around the Costa Blanca. A booking deposit of 20% is required to reserve and the balance to be paid 8 weeks before arrival. Changeover days are negotiable depending on existing reservations, midweek bookings accepted though peak season Saturday only. Any evidence of smoking anywhere within the property will result in the forfeit of the damage deposit. 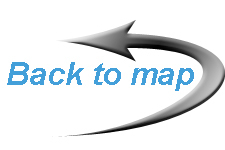 Car hire is not essential, airport transfers can be arranged from either Murcia or Alicante airport . 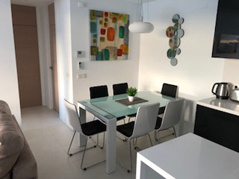 A damage and key deposit of £200/200euros is required and will be returned after satisfactory inspection of the apartment. Payment may be made by personal cheque, bank transfer, or secure credit/debit card payments.